In NGARO we develop intelligent solutions which allow real time detection, geographic positioning, management and tracking of thermal signature identifiable events, providing global knowledge about surrounding security conditions to the operator. NGARO products feature a common architecture based on independently operating and marketed modules which are combined and optimized in order to design solutions that fit the various security markets, and which are easily integrated within surveillance systems from other manufacturers. NGARO® Sentinel is a surveillance system for extensive perimeters, restricted access areas, roads and land confined environments. The image analysis algorithms used by NGARO® Sentinel are optimized for a land environment and work with thermal cameras installed on fixed posts or stopped cars. 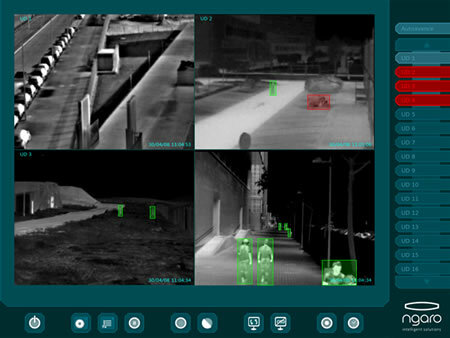 Along with the features of the other Ngaro systems, NGARO® Sentinel automatically performs surveillance along the perimeter, provides information about approaching and behavior of vehicles and people, intrusions, presence inside, tracking of the path followed by a target and detection of dropped objects. NGARO® Sentinel supports, as well, multiple security areas to be defined around the perimeter with different criticity levels. Detection in the dark, as well as in low visibility scenarios, such as rain, fog or environments saturated with smoke. Longer detection range. 500m range guaranteed for a mid-end post. Reduction of the number of cameras to install to a 1/10 ratio. Lower investment on civil work needed. Morphological detection which does not discriminate the identity of the targets, no restriction for its installation in public spaces. NGARO® Watchman is a system for early detection of fires on forest scenarios and logistic perimeters of extensive area. The image analysis algorithms used by NGARO® Watchman are optimized for operating with thermal cameras placed in fixed poles, being able to cover 360 degrees from their position, or placed in stopped cars. Along with the rest of features which Ngaro systems have to offer, NGARO® Watchman automatically monitors the industrial or forest area and gives information about for main types of alarms: moving heat source, heat sources persistent in time, heat sources increasing their temperature during time and might mean the beginning of a fire and heat sources with the growth features characteristic of a fire. Furthermore, NGARO® Watchman shows the evolution of the fire making extinguishment easier. The guaranteed range for a mid-term detection post is 5km radius, which equals 8.000 hectare in an optimum visibility scenario. NGARO® CoastGuard is a coastal surveillance system for maritime, fluvial and harbor scenarios. The image analysis algorithms used by NGARO® CoastGuard are optimized for operating on a maritime scenario. NGARO® CoastGuard works with thermal cameras placed in fixed poles, as well as on stopped coastal surveillance vehicles, covering 360 degrees from its position. Along with the rest of features which Ngaro systems have to offer, NGARO® CoastGuard automatically monitors the maritime or fluvial area and gives information about approximations, intrusions, presence and the trajectory of the vessels located within the exclusion zone. NGARO® Flare is a system for detecting combustion and throwing of flares on sports events and civil demonstrations. The image analysis used by NGARO® Flare are optimized for operating on heavily busy areas. NGARO® Flare works with a combination of thermal and visible cameras placed on fixed poles. Along with the features which Ngaro systems have to offer, Flare performs automatic detection, location and tracking of flares. Using conventional video imaging, identification of the person igniting the flare is performed. Early detection of fires in combustible materials storage areas. Monitoring of overheating on critical elements of an energy transport and transformation network. Detection of overheating on flammable bulks warehouses. Early detection of fires on industrial premises. 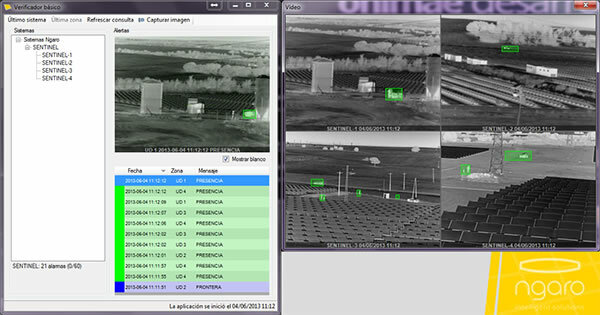 Perimeter surveillance of trading estates and large logistic and industrial facilities. Product inspection / quality control. Preventive maintenance of mechanical or electrical elements. Development of high performance thermal image analysis algorithms. Development of real time systems. Design and implementation of relational databases. Development of applications for reception, storage and look up of distributed data. High performance, proprietary GIS engine for real-time requirements. Development of advanced user interfaces. Proprietary real time compression codec for radiometric imaging. Development of systems for remote data control and acquisition via IP. Development of automation systems based on thermal imaging. Our solutions feature a common architecture based on independently operating modules which continuously analyze the environment, identifying and discriminating targets, generating alarms according to user-defined parameters, compressing and transmitting thermal video images, making display, tracking and management of all this information easier from command and control centers, either mobile or fixed, and allowing the activation of pre-established response automatisms. NGARO solutions are structured on robust distributed intelligence networks and consist of two basic subsystems, which are independently marketed and also operate independently: the Detection Units and the Command and Control Centers. Furthermore, Ngaro solutions allow the integration of surveillance subsystems based on complementary technologies and are easily integrated within preexistent surveillance systems. The Ngaro Detection Units analyze the thermal pattern of the environment in real time, detect events automatically according to user-defined parameters and transmit them to the Command and Control Centers, whether developed by NGARO or by other companies, as well as to Alarm Stations. Ngaro Detection Units encode, compress and send thermal video, along with metadata, to the Command and Control Centers and are able to integrate information coming from surveillance subsystems based on vision and sensoring technologies by other manufacturers. Ngaro Detection Units use high performance image analysis and compression algorithms specifically designed for operating with thermal images and optimized according to what each market needs. The Detection Unit act directly into the configuration of the infrared cameras in order to obtain the very best from their features. Command and Control Centers are a robust solution designed for guaranteeing to the operator real time knowledge and management of the information provided by Ngaro Detection Units and by surveillance subsystems by other manufacturers. Command and Control Centers developed by NGARO make possible for the operator to quickly supervise events and the environmental security conditions. Ngaro Command and Control Centers consist of four proprietary user subunits which operate independently. NGARO® GIS is a module for monitoring the state of the surveillance system as well as the operating capacity over digital cartography. 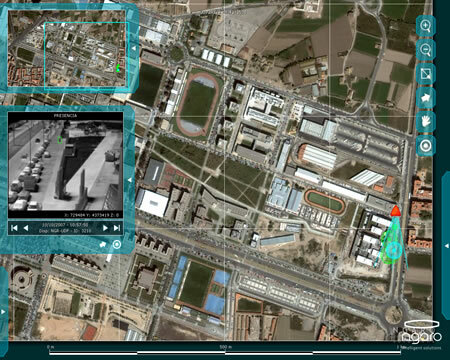 - Displays alarms in GIS format over an orthophoto of the scenario, digital planimetry or a conceptual diagram. - Allows to display images from the identified events. - It is designed for storing large amounts of geographic information in real time. - Grants scrolling of the photography in thousandths of second with a 25cm resolution. - Synchronously supplies information about security system state. 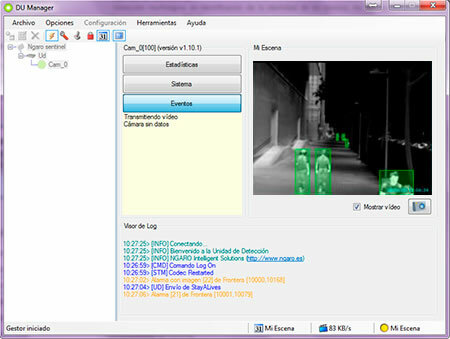 NGARO® Viewer is a module for simultaneously displaying thermal video and CCTV sequences with over-imposed OSD indications of events. - Connection capacity for unlimited Detection Units. - Simultaneous display of up to 32 cameras. - Configurable display and arrangement of cameras. - Acoustic warnings for alarms. - Connection to the system via internet. 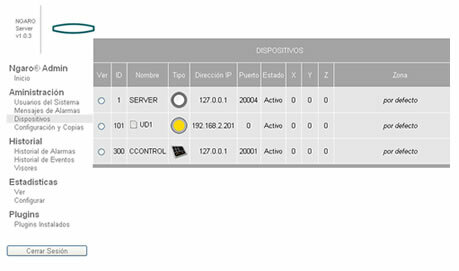 NGARO® Server is the module that takes the function of alarm server and global system manager. - Receives, stores in a database and manages alarms. - Manages client and secondary control centers subscriptions. - Arranges distribution and sending of alarms to each client and control center according to user profile, whether to fixed or mobile units. - Supports search queries to the detected events history, whether in local or remote mode, via web server. - Enables or disables detection units or complementary surveillance subsystem without interrupting the operation of the system. 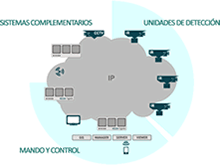 - Easy integration and management of surveillance subsystems based on other technologies through serial port or digital input. NGARO® DU Manager is the module which allows remote configuration of the Detection Units via IP network, making information management and generation of activity reports an easy task. Module destined for configuration, startup and system maintenance tasks. The application NGARO® Desktop allows you to connect Ngaro systems with the monitoring stations you prefer. Ngaro, thanks to its R & D department, can adapt the application to the communication protocol of each monitoring station to make the integration extremely easy and fast. We offer, this way, the best detection using thermal technology, with control and alarm management completely centralized in a monitoring station, completely autonomously without the need for an specific control center. Also, for central advanced monitoring stations, if required, we can supply specific control centers where you can georeferenciate Ngaro alarms to have a more accurate response. 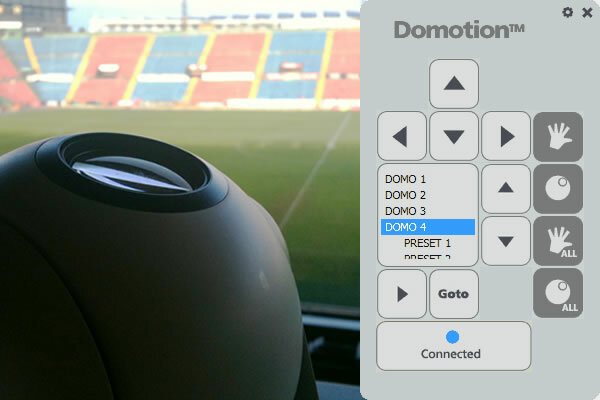 NGARO® Domotion is an advanced tool for automatic tracking of stationary and moving targets within Ngaro systems. Our georeferencing capability allows us to accurately locate an alarm using GPS or UTM coordinates allowing us to follow the target with dome cameras, fully automatically, without losing it along the entire detection process, allowing to switch to manual control in case an operator may require it. Georeferencing alarms again makes a distinction between conventional detection systems and advanced detection systems such as those proposed by Ngaro.